Single-port laparoscopic surgery is predicted to be the next generation of minimally invasive surgery. 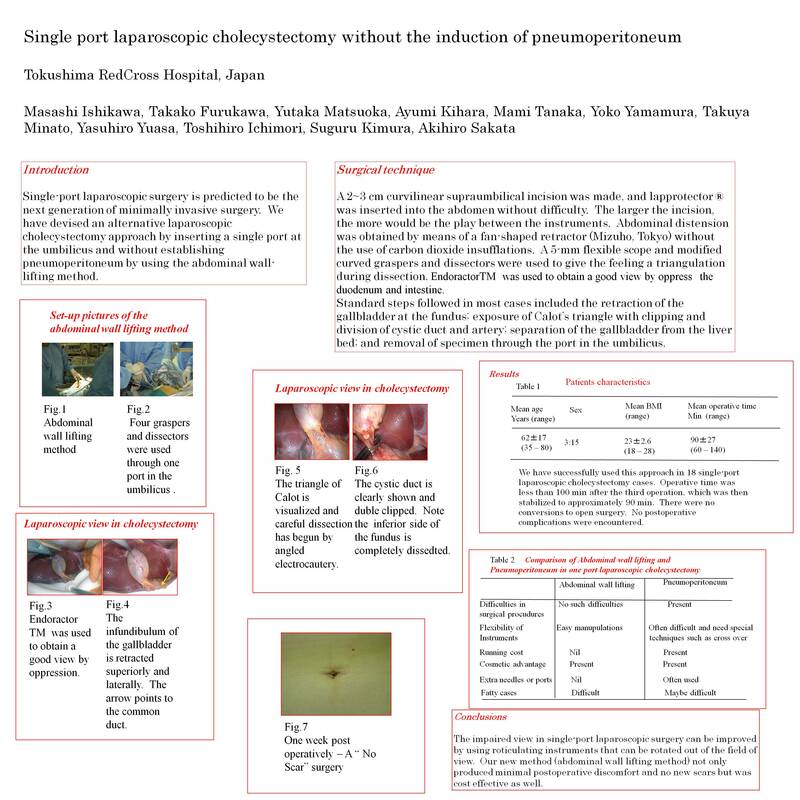 We have devised an alternative laparoscopic cholecystectomy approach by inserting a single port at the umbilicus and without establishing pneumoperitoneum by using the abdominal wall-lifting method. A 2~3 cm curvilinear supraumbilical incision was made, and lapprotector ® was inserted into the abdomen without difficulty. The larger the incision, the more would be the play between the instruments. Abdominal distension was obtained by means of a fan-shaped retractor (Mizuho, Tokyo) without the use of carbon dioxide insufflations. A 5-mm flexible scope and modified curved graspers and dissectors were used to give the feeling a triangulation during dissection. Standard steps followed in most cases included the retraction of the gallbladder at the fundus; exposure of Calot’s triangle with clipping and division of cystic duct and artery; separation of the gallbladder from the liver bed; and removal of specimen through the port in the umbilicus. We have successfully used this approach in 15 single-port laparoscopic cholecystectomy cases. Operative time was less than 90 min after the third operation, which was then stabilized to approximately 75 min. There were no conversions to open surgery. No postoperative complications were encountered. The impaired view in single-port laparoscopic surgery can be improved by using roticulating instruments that can be rotated out of the field of view. Our new method not only produced minimal postoperative discomfort and no new scars but was cost effective as well.